My argument here is that the use of psychoactive substances only came to be viewed as a social problem under particular social and economic conditions. In the medieval world, the peasants could get as drunk as they liked, and no one suffered much but themselves. When wage labour and factory labour became the norm, it suddenly mattered if labourers were drunk, or stoned, and less productive than they might be. Life in emerging industrial Britain was also more than conducive to heavy drinking and drug use. Dislocated from home and family, working 12 hours or more a day for seven days a week, alcohol and drugs provided the worker with a quick and easily accessible escape, maybe the only one they could hope for. The controls that were placed on the use of mind-altering substances from the beginning of the 20th century could not stamp it out, however. Prohibition of alcohol in the United States was a resounding failure, and although the availability of opium was restricted, the pharmaceutical industry started to produce a new array of mind-altering chemicals. As options for self-prescribing became more limited, the use of mind-altering drugs came increasingly under the control of medical practitioners. Women in particular, less inclined to drown their sorrows in drink than men, increasingly went to their doctor to ask for a chemical salve for difficult and unfulfilling lives. The problems for which these drugs were used were transformed into medical problems. As this occurred the nature of the drugs and their mind-altering properties became obscure, and the reasons why people were using them were concealed beneath a medical mythology. It is only by exploring the social and economic conditions in which our current attitudes to mind-altering drugs were formed, therefore, that we can understand the real nature of these substances. Only then can we start to make rational decisions about how they might be used. In medieval and Tudor England, heavy drinking was an accepted part of rural life. Weak beer was consumed instead of water by all the family on a daily basis, but festivals and holidays, of which there were many, were occasions for drinking to inebriation. Drunkenness was not regarded as problematic in pre-industrial society, and the country people were left to enjoy their intoxicating habits. It was only in the 18th century, when the increasing urban population took to drinking gin in large quantities, that widespread concern about alcohol use emerged. 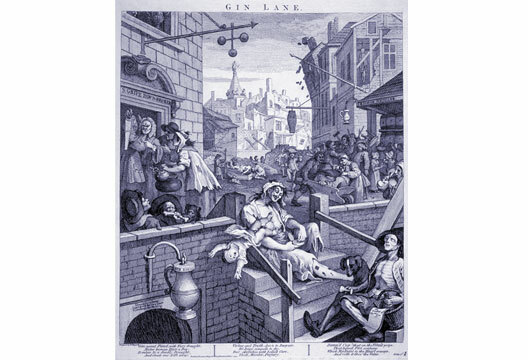 Hogarth’s famous engraving, Gin Lane, indicates the moral outrage that had started to form around the drinking habits of the poor. Freed from the customs and obligations of rural life and displaced into the exploitative environment of early capitalist cities, the nascent working class turned to the instant oblivion provided by the newly imported, super-strength liquor, gin. Gin was blamed for rocketing rates of crime, prostitution and debt, and the upper classes lived in fear of a breakdown of law and order, as well as bemoaning the decline in the nation’s productivity. The Gin Acts of the 18th century were the first legislative attempts to control the people’s use of mind-altering chemicals (Gately, 2008). A similar story played out with opium, which was widely used by all classes during the 19th century. The medicinal and recreational qualities of opiate drugs are particularly difficult to disentangle, and addiction to opium was likely to have been common among working people who used it either to alleviate the pain of physical ailments, to relieve emotional strain or for enjoyment. Although the construction of the ‘opium problem’ had many drivers – including the professional aspirations of pharmacists and doctors, and pressure from the United States over the opium trade with China – concerns about non-medicinal use leading to the dissipation of the working class fuelled public health campaigns against opium use, and led to the beginnings of the legal regulation of its availability in the 1868 Pharmacy Act (Berridge, 1977). Cocaine in various preparations was also widely available and vigorously promoted in the 19th century. Vin Mariani, a popular patent medicine developed in 1863, was one of a number of cocaine-containing preparations on the market in Europe and the United States. It was made from a mixture of Bordeaux wine and coca leaves, the ethanol in the wine extracting the cocaine from the coca leaves. It was endorsed by Pope Leo XIII, who awarded it a Vatican gold medal and appeared on advertisements that claimed the drink restored ‘health, energy, strength and vitality’. The performance enhancing properties of the drug were also widely recognised, and used to promote another cocaine-containing preparation, Coca-Cola. The drug started be demonised when it became associated with use by black people in the US and ordinary British soldiers during the First World War (Berridge, 1977; Cockburn & St Claire, 1998). The trend for regulating people’s use of mind-altering substances culminated in national prohibition of the liquor trade in the United States, which came into effect in 1920 and lasted 13 years. Prohibition is widely acknowledged as a piece of class legislation. It was the result of a concerted campaign by the Anti-Saloon League, and its aims were never to abolish the consumption of alcohol entirely, but to shut down the saloon, where working people went to drink. Possession and consumption of alcohol were not prohibited, only its commercial trade, and those with the foresight and the resources were free to drink alcohol they had stored before prohibition came into force. When the Great Depression hit, and the masses needed pacifying, prohibition was finally repealed (Burnham, 1968). Barbiturate drugs first became available in 1903, and although they revolutionised anaesthesia and the treatment of epilepsy, they were most widely prescribed for anxiety and insomnia. Amphetamines, available as tablets from 1937, were prescribed for the treatment of mild depression or ‘neurosis’. They were issued to pilots during the Second World War, and soon started to be used as diet pills (Rasmussen, 2006). In the mid-20th century use of prescription uppers (amphetamines) and downers (barbiturates and later benzodiazepines) was rife, and far more common than the use of any illicit substance. In 1955 the quantity of barbiturates being used in the USA was sufficient for the treatment of 10 million people on a continuous basis for a whole year, representing 6 per cent of the population of the time, or 8.6 per cent of the adult population (Glatt, 1962). In the UK a survey conducted in 1960 found that the quantities of amphetamines being prescribed were enough to supply 1 per cent of the whole population with twice daily doses on a long-term basis; and 85 per cent of prescriptions were issued to women, mostly those between the ages of 36 and 45. Given that 1 per cent is an average figure including children, rates of use among middle-aged women must have been around 5 per cent or even higher. A third of prescriptions were issued for weight loss, a third for depression or anxiety, and a third for a medley of vague conditions, including tiredness, pain and psychosomatic complaints (Kiloh & Branden, 1962). In the US, by 1971, 5 per cent of the total population were being prescribed amphetamines (Rasmussen, 2008). Many of these pills were sold on for profit, and the majority of illicitly consumed substances during the 1960s and 1970s were of pharmaceutical origin. In the early 1970s, 80–90 per cent of the stimulants sold on the street in the US were products of pharmaceutical firms (Graham, 1972). The massive advertising campaigns that promoted these drugs played on the psychological insecurities of the age, and were mostly targeted at women. Advertisements for amphetamines paraded images of the competent and stylish state that women should aspire to, and others persuaded doctors that unmarried women, or men dominated by women, were good candidates for Valium. In 1970 US senator Thomas Dodd complained that it was the pharmaceutical industry’s ‘multihundred million dollar advertising budgets, frequently the most costly ingredient in the price of a pill, have pill by pill, led, coaxed and seduced post world war 2 generations into the “freaked out” drug culture plaguing the nation’ (Graham, 1972). As drug use became increasingly associated with pleasure and expanding consciousness, rather than relieving distress, it became a symbol of rebellion. By the late 1960s illicit drug use was strongly associated with the counter-culture – the hippy movement, the anti-Vietnam war protests, the 1968 student uprisings, etc. Drug use was part of the revolution against conservative mores and against the regimented system of capitalist production and its associated war machine. In reaction, the degrading effects of drug use became a focus for social concern, whipped up by the media, which conveniently diverted attention from the political and economic problems of the 1970s. In the early 1970s legislation was passed in the US and UK that attempted to put the genie back in the bottle. Amphetamines, along with other drugs like LSD and cannabis, became prohibited substances. Legitimate medical uses of amphetamines were restricted to narcolepsy and ADHD, and production quotas were applied. Prescription and diversion plummeted, but people turned to illicitly manufactured substances or imported drugs like heroin and cocaine (Rasmussen, 2008). Meanwhile prescriptions for benzodiazepines continued to rise (Lader, 1991). The emerging drug scene presented a challenge to psychiatrists, whose drugs consisted entirely of psychoactive substances. To preserve the specialist aura of prescribing, and to avoid being seen as drug peddlers, the profession needed to present its practice as commensurate with the increasingly sophisticated use of drugs in other parts of medicine. It is no coincidence that the ‘disease-centred’ model of drug action in psychiatry emerged alongside the illicit drug scene (Moncrieff, 2008b; see also http://joannamoncrieff.com/2013/11/21/models-of-drug-action). By presenting psychiatric drugs as targeting underlying abnormalities, the disease-centred model helped to repackage the use of psychoactive substances as a bona fide medical treatment quite distinct from the use of drugs in other contexts. It was particularly important to distinguish newly introduced psychiatric drugs from amphetamines, since the ubiquitous use of the latter was causing increasing concern. Some of the first drugs proposed to be ‘antidepressants’ in the late 1950s were in fact stimulant-type drugs (used in the treatment of tuberculosis), but their stimulant effects were downplayed (Moncrieff, 2008a). Discussants at a conference held in 1962 were keen to stress how the new ‘antidepressants’ were ‘much more specific’ than stimulants (Goldman, 1966). The concept of an ‘antidepressant’ helped the process by defining the new drugs by their proposed effects on the presumed biological mechanism of depression, rather than their pharmacological properties (even though there was no evidence that they had such specific effects: see tinyurl.com/gqzl9bg). The disease-centred model was undermined, however, by the continued prolific use of benzodiazepines. By the 1980s it was clear that however much they might be trumpeted as a specific treatment for anxiety, they were being used for their tranquillising properties, prescribed to many people, especially women, in order to numb the difficulties of daily life. The scandal over dependence and over-prescribing that erupted in the late 1980s forced the pharmaceutical industry to commit itself wholeheartedly to the disease-centred model for marketing its new drugs. The 1990s blockbuster ‘antidepressants’ such as Prozac and Paxil were advertised not for their tranquillising qualities (which in any case they do not possess), but for their ability to reverse an underlying chemical imbalance. In this situation it became as important to market the disease as the drug, and companies funded ‘disease awareness’ campaigns to encourage people to think of themselves as ‘depressed’ (Breggin & Breggin, 1995). Bipolar disorder has been promoted more recently using the same language and techniques (Healy, 2006). There is no categorical distinction between drugs that are prescribed by doctors for mental health problems and those that are used for ‘recreational’ purposes. All these drugs act on the brain to induce an altered state of mind, in some cases pleasurable, in some cases not. Indeed, the term recreational is misleading, since much illicit drug use is concerned not simply with getting ‘high,’ but with reducing anxiety and suppressing the memory of traumatic events, or the reality of current circumstances (Moncrieff et al., 2013). Controlling people’s use of mind-altering substances has been a major concern of capitalist societies, in order to ensure the safety and productiveness of the labour force, and the law and order of the industrial urban environment. As the possibilities for self-initiated drug use have been curtailed by legislation, however, the use of mind-altering substances has been increasingly medicalised. The pharmaceutical industry knows that what constitutes a medical indication for psychoactive drug use is infinitely malleable, and that this malleability can be used to capitalise on the ancient human desire to alter one’s mental state. Large swathes of the population can be persuaded to view themselves as needing drug treatment for anxiety, depression, bipolar, or whatever is the flavour of the decade (Healy, 2004). Just as governments of the mid-20th century tolerated the widespread use of barbiturates and amphetamines, governments of the 21st century have shown no concern about the rapidly rising use of antidepressants, antipsychotics and medically prescribed stimulants. Although packaged as sophisticated disease-targeting interventions, they fulfil the same role that the widespread use of opium and cocaine-containing ‘tinctures’ did in the 19th century. They provide the promise of a quick fix, and a mind-altering experience that temporarily removes the user from unwelcome thoughts and circumstances. Drugs that produce pleasurable mind-altering effects remain problematic for the medical account of prescription drug use, however. Although the dangers of dependence and withdrawal effects is undoubtedly influential in the campaign to reduce the prescribing of benzodiazepines, their euphoric effects make recreational and medicinal use hard to distinguish, and place them in an ambiguous relation to medical practice. On the other hand, antidepressants are generally unpleasant to take, if anything. Therefore, general practitioners in the UK are now penalised for prescribing benzodiazepines on a long-term basis. Despite the advent of new, similar drugs like the Z-drugs and pregabalin, all of which were claimed, erroneously, on introduction to lack dependence-inducing properties, numbers of prescriptions have flat-lined (Ilyas & Moncrieff, 2012). In contrast, antidepressant prescriptions continue to rise year on year, with little official concern (Ilyas & Moncrieff, 2012). As this brief historical survey suggests, modern society is deeply irrational and dishonest when it comes to drugs. At present we are stoking the desire for mind-altering effects with medically authorised substances, some of which may be just as harmful, or worse than their illicit counterparts. We may also be missing opportunities to explore the therapeutic effects of some illicit substances, like the potential of opiates to suppress psychosis as noted anecdotally by people in the field of addictions. The regulation of psychoactive substance use is not necessarily wrong in itself, and every society will wish to preserve order and prevent the ravages that excessive drug or alcohol use can entail. We should remember that among those at the forefront of the campaign for the prohibition of alcohol in the US were women, sick and tired of the abuse they suffered at the hands of drunken husbands (Gately, 2008). The irrationality of current drug policy, however, acts as an impediment to the development of informed and responsible attitudes towards the benefits and dangers of psychoactive substances. Joanna speaks at the Joint Annual Conference of the History and Philosophy of Psychology Section and UK Critical Psychiatry Network on 22-23 March. Berridge V. (1977). Opium and the historical perspective. Lancet, 2(8028), 78–80. Breggin, P.R. & Breggin, G.R. (1995). Talking back to Prozac. New York: St Martin’s Press. Burnham, J.C. (1968). New perspectives on the prohibition ‘experiment’ of the 1920's. Journal of Social History, 2, 51–68. Cockburn, A. & St Claire, J. (1998). Whiteout: The CIA, drugs and the press. New York: Verso. DeGrandpre, R. (2006). The cult of pharmacology. How America became the world's most troubled drug culture. Durham, NC: Duke University Press. Gately, I. (2008). Drink: A cultural history of alcohol. New York: Gotham Books. Goldman D. (1966). Critical contrasts in psychopharmacology. In M. Rinkel (Ed.) Biological treatment of mental illness (pp.524–533). New York: L.C.Page & Co.
Graham, J.M. (1972). Amphetamine politics on Capitol Hill. Society, 9, 14–22. Healy, D. (2004). Shaping the intimate: Influences on the experience of everyday nerves. Social Studies of Science, 34, 219–245. Healy, D. (2006). The latest mania: Selling bipolar disorder. PLoS Medicine, 3(4), e185. Ilyas, S. & Moncrieff, J. (2012). Trends in prescriptions and costs of drugs for mental disorders in England, 1998 to 2010. British Journal of Psychiatry, 200, 393–398. Kiloh, L.G. & Brandon, S. (1962) Habituation and addiction to amphetamines. British Medical Journal, 2(5296), 40–43. Lader, M. (1991). The history of benzodiazepine dependence. Journal of Substance Abuse Treatment, 8, 53–59. Moncrieff. J. (2008a). The creation of the concept of the antidepressant: An historical analysis. Social Science and Medicine, 66, 2346–2355. Moncrieff. J. (2008b). The myth of the chemical cure. Basingstoke: Palgrave Macmillan. Moncrieff, J., Cohen, D. & Porter, S. (2013). The psychoactive effects of psychiatric medications: The elephant in the room. Journal of Psychoactive Drugs, 45, 409–415. Rasmussen, N. (2006). Making the first antidepressant: Amphetamine in American medicine 1929–1950. Journal of the History of Medicine and Allied Sciences, 61(3), 288–323. Rasmussen, N. (2008). America's first amphetamine epidemic 1929–1971: A quantitative and qualitative retrospective with implications for the present. American Journal of Public Health, 98(6), 974–985.